Here's some of my hobby related goals for 2017 with a brief look back at 2016. Blood Bowl, Blood Bowl, Blood Bowl! 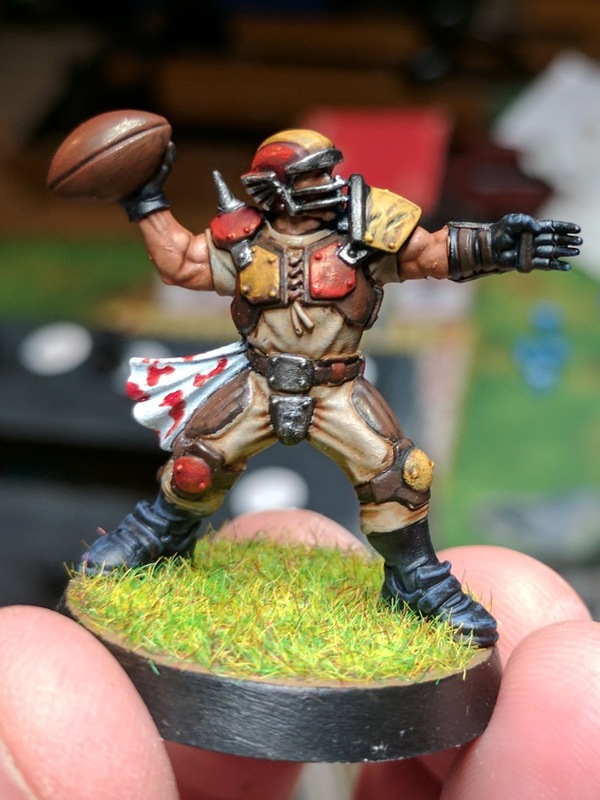 Like many of you, the holidays brought me the new Blood Bowl box set. I've been looking forward to this release and diving into this game for quite some time (circa NOVA 2015). I also picked up the Season 1 supplement and proceeded to read this and the official rule book cover to cover as soon as I could get the plastic wrap off. About an hour after that I had both teams assembled and ready to brawl! 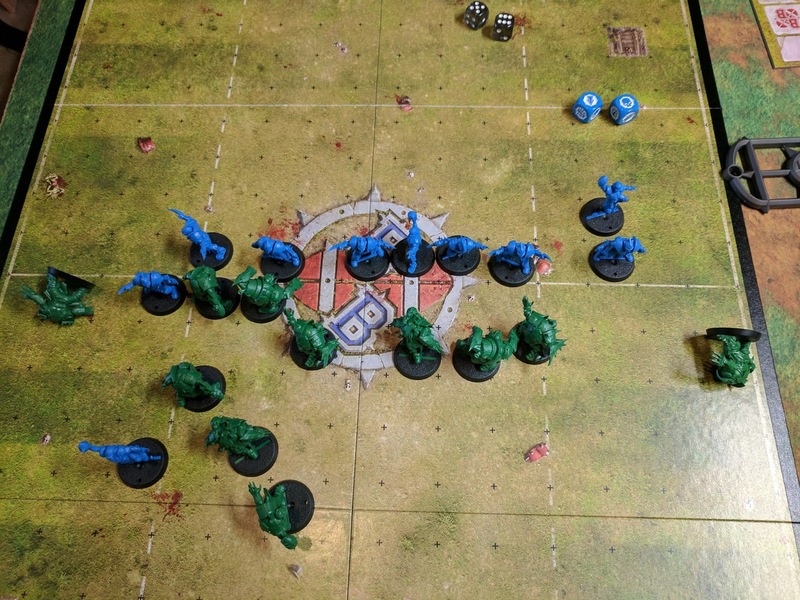 The minis in this set are really well done, both Humans and Orcs, and the push-fit option is a really nice touch if you want to start playing the game quickly -- you and a friend could probably have everything together and ready to kickoff within a half hour. I recommend putting the players together first and easing into the rules by following along with the Boot Camp section of the rules as the core mechanics of the game are much easier to grasp physically interacting with the board and pieces. 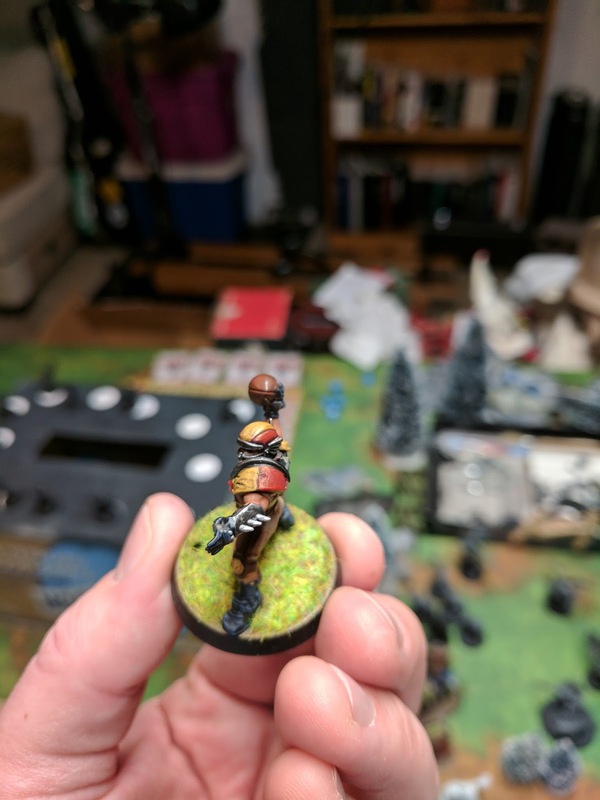 A couple of my friends have been playing BB for a long time so I've benefited from their advice on tactics and strategy. It's a fantastic game and rule set and definitely one of the best games in GW's catalog. While not 100% done, I'm still really happy with how this turned out for one afternoon paint session. I'll be batch painting the 6 linemen next and really pushing to get this done as soon as possible and definitely before the Dwarf team goes on sale. My buddy and I are forming a small local league with some exhibition games scheduled for next week where we'll hopefully convince 2 more of our friends to commit and jump into the game like we have. 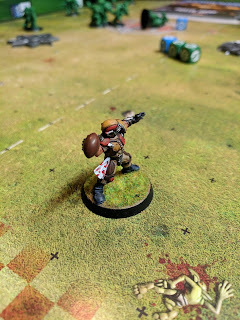 We've also been playing a lot of Blood Bowl online which has been fun -- it's not without its flaws (the tablet version anyway) and shouldn't be viewed as a direct 1 to 1 translation of the tabletop game, but it's a good way to try out other teams and practice player formations/placement. A pretty bizarre year in general, but a great year for Games Workshop and fans of their games. It was the slowest hobby year for me since starting this blog but that was mostly due to real life stuff (3 kids now and work was extra busy) and honestly I anticipated things to slow down or take a back seat to higher priorities. I had intended to do more with 40k, particularly with Harlequins, but the state of 40k really wore me down and just wasn't as exciting to me as it used to be. I had some ideas about what I was going to do with Harlequins, both as an ally to my Dark Eldar and also a standalone Masque, but shortly after putting pen to paper GW released the draft FAQs which fundamentally changed some of those ideas, which is totally fine by me! I'm really encouraged to see GW reach out to the community and make a concerted effort to fix their flagship game and I look forward to a new edition or reboot for 40k. Honestly, until something is done to address the fundamental issues with 40k you wont see me participating much in the gaming side -- I'll still work on painting my existing armies in between other projects. 2016 saw me try out other game systems (Age of Sigmar), play a lot of board games, focus a lot more on family and music. From that perspective it was a really good year and I plan on doing all of those and even more going into 2017. Build and paint a 2000 point army for Age of Sigmar - this will most likely be Stormcast Eternals. I'd still love to do Fyreslayers but GW will need to release a start collecting bundle for them; I'm not dropping $800 for them, and that's no exaggeration... I have a spreadsheet with a 2k pt Fyreslayer list and prices and it was $800 USD, that's more than a 40k army! 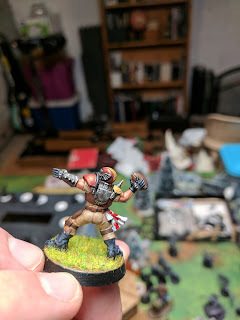 Build and paint 3 Blood Bowl teams - Humans are first, then Orcs, but my sights are set on the Dwarf team and oh boy do those models look awesome! Play more games! Definitely play more AoS and BB but also new games in general. I love playing board games and card games of all varieties and it's always good fun to try new ones, especially when you have a great group of friends to play with. Participate in a Blood Bowl league, using season rules and all. Continue to focus on making music. It may seem separate from the hobby stuff but it is my passion, not to mention I only have a limited amount of "free time" (if you can even call it that, haha) and this is one of those activities I split my hobby time with. So there you have it. I of course would like to get better and more frequent with painting and if I can achieve that I'll have even more to share here on the blog. I've gotten better about making time for it over the holidays so I'd like to ride that momentum here in the new year. What are some of your goals for 2017?